Simon is at preschool this morning. He was not happy that I took away his pacifier! His teacher cheered him up a bit by showing him his family poster with pictures of our family on it. He showed her Gabbie and Zachy (how he says Zachary) a few times each. I spend a lot of time while he’s away worrying that he’s doing ok. I guess that’s normal! This week, Simon and I started the Preparatory Curriculum for Letter of the Week, from Brightly Beaming Resources. All the information is free on the website! The Preparatory Curriculum is meant for ages 2-4 and it prepares children for the Preschool Curriculum, which focuses on learning the sounds of the letters. Each week there is a theme of the week, as well as a vocabulary word, a shape or a color, a letter, a number, and a nursery rhyme. A learning poster is used In order to teach the concepts each week. I made ours using half a sheet of poster board. I added scrapbook paper backgrounds and used stickers to label each section. 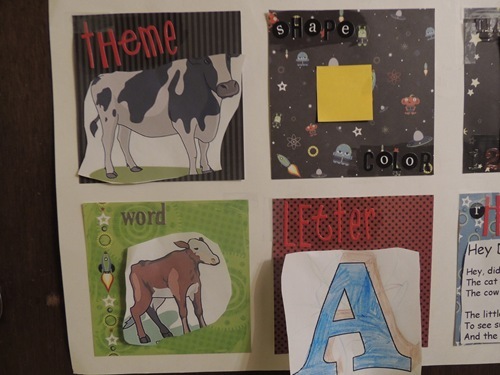 The sections are Theme, Shape / Color, Number, Word (vocabulary), Letter, and Rhyme. Each day of the week, a new concept is added to the poster. The concepts stay up on the poster until the following week, aside for the shape, which is colored in the following week to introduce a color. The theme for week number 1 was Cows. We added the picture of the cow on Monday, as well as the picture for the vocabulary word “calf.” I told Simon that it was a picture of a baby cow and taught him the word calf, but he will point to the pictures and say “cow” and “baby,” only repeating “calf” when I ask him too. On Tuesday we added the shape of the week, a square. Simon has repeated the word square and we spent some time looking at his blocks which are also squares. 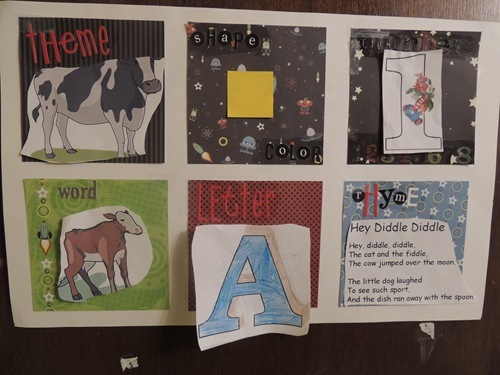 On Wednesday we learned the letter A. As you can see I did most of the coloring myself, but Simon added a few squiggly lines as well. On Thursday we learned the number 1. We put 1 sticker on the number 1. I printed the A and the 1 from the Preschool Coloring Book. 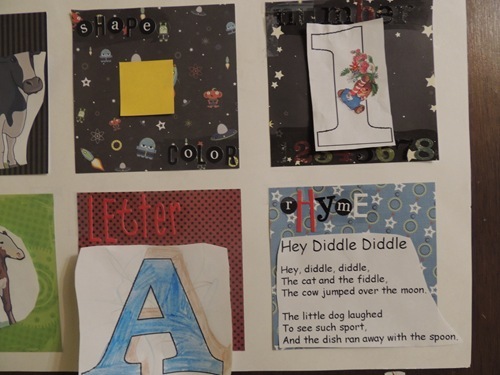 Today, we added the weekly nursery rhyme, Hey Diddle Diddle. Obviously Simon can’t read the rhyme, but it is posted on the poster in case the parent doesn’t know the words yet. I do know the words to this one and recited it with Simon while we were getting dressed this morning. He already is saying the words “moon” and “spoon” along with the rhyme. Each week, the website suggests ideas of what to do to reinforce the concepts we are learning. We did a few of these suggestions and will have to work on adding more of them in future weeks! Firstly, you should choose a book about the theme of the week. You can choose a new book every day or read the same one each day. I decided to read the same one each day and I chose a book that was on the suggested list that we already have. Simon loved this book! He was mooing and click clacking along right away. Zachary also enjoyed the book on the days he was home when we read the story. It is also suggested to read a poem about the theme each week. We did not do this for this week. We also didn’t do the suggested gross motor activity of pretending we are cows. Today we did add Old McDonald’s farm song with the changed chorus from our music class: “Moo moo stand up, moo moo turn around, moo moo clap your hands, sit back down.” Simon enjoyed this activity. On Fridays we are supposed to do a fine motor activity and this week’s is making a cow out of construction paper squares. I think we might try this later today. I feel that our first week following the program has gone well! Simon and I both enjoyed the activities we did. Starting Monday, we will be putting prior week’s concepts into a book that we will look at each Friday for review. Next week’s theme is Jungle! I am not quite sure how I will teach that one!